NEW! Multi-language support-English, Korean, Italian, French, German, Russian, Czech, Turkish, Portuguese, Polish, Romanian, Ukrainian, Japanese, Greek, Croatian, Bulgarian and many more. 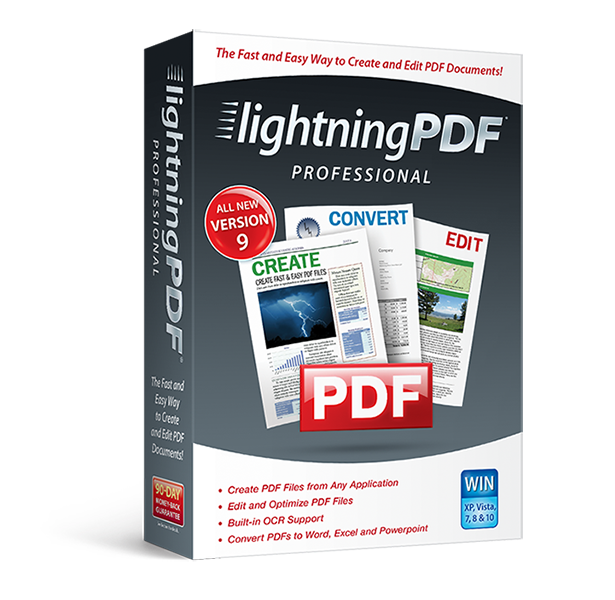 Lightning PDF Professional 9 is an all-in-1 PDF solution for creating industry-standard PDF files, editing PDF text and images, converting PDFs to Office documents, adding comments plus editing and filling in PDF forms. You can also sign PDF documents with certificated digital signatures, protect PDF files with passwords and use OCR technology to make text in image-based PDF files searchable and editable. It’s a must-have program for anyone who works with PDF files. 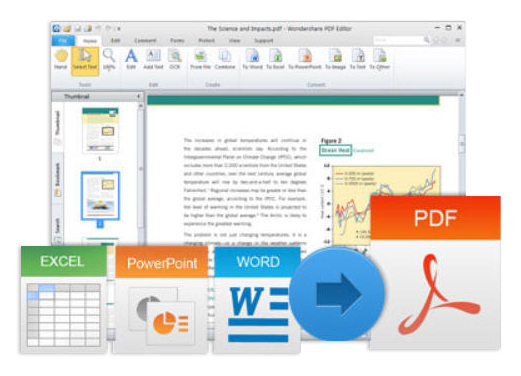 Create PDFs from a variety of programs including Microsoft Word, Excel and PowerPoint. Basically, if you can open it on your computer, you can make it a PDF! Combine different types of files into a single PDF. All documents you create will be 100% accessible by Adobe Reader, Adobe Acrobat and other PDF readers. Add, revise and delete text in 2 easy steps. Adjust font, size, color and more. Insert, crop and delete images accurately and at high speed. Even adjust image height and width. Easily add, delete and extract pages to create new, informative PDF documents--no need to start from scratch. Insert, delete and update watermarks across multiple pages. Compress PDFs to a suitable size for uploading to the Internet, attaching in emails or for printing. Use preconfigured settings or set the settings yourself. Convert a PDF to a Microsoft Word document so you can easily manipulate PDF content without needing to type it out. 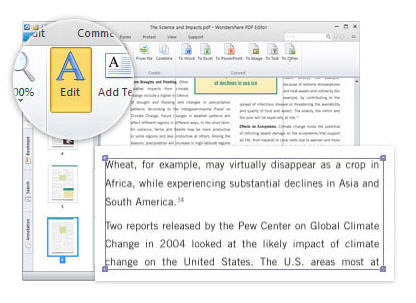 Your converted Word Document will look the same as the original PDF, retaining all formatting. Manipulate any data anywhere. Extract PDF tables to Microsoft Excel spreadsheets for further analysis or calculation while preserving the original data and layout. Eliminate risk of editing by others or easily share your image online by converting PDF files to standard image formats, including .jpg, .png, .tiff, .gif and .bmp. Save time and work efficiently with batch editing. Sticky note, text box, text highlighters, freehand drawing tools and all kinds of shapes are available for providing comments and feedback. Then stamp it “Revised”, “Reviewed”, “Received”, “Approved” or “Confidential. You can even sign it using your own digital signature. Collaborate with colleagues regardless of their software. 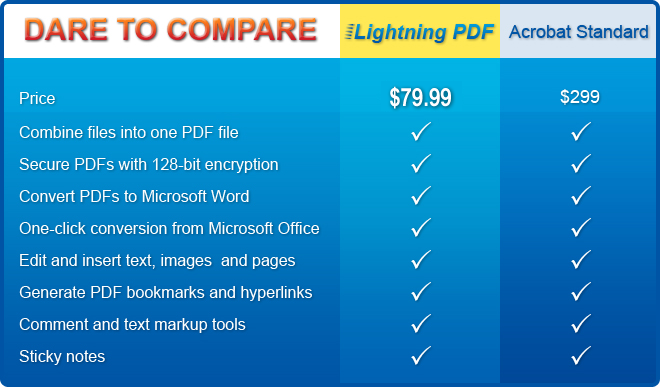 Comments made with Lightning PDF Pro are viewable in Adobe Reader and Acrobat and other popular PDF readers. Make image-based PDF text searchable while retaining the document’s appearance. 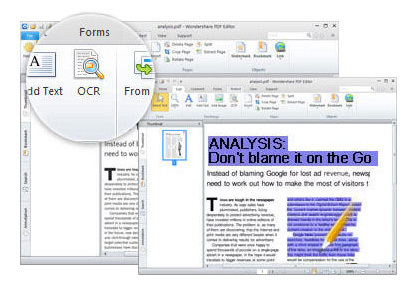 After OCR, a scanned, image-based PDF document is digitized to become an editable file. Insert, delete, and edit text, images and more. Work with scanned PDF text in almost any language, including: English, Korean, Italian, French, German, Russian, Czech, Turkish, Portuguese, Polish, Romanian, Ukrainian, Japanese, Greek, Croatian and many more. Customize and edit PDF forms from a variety of templates. No need to start from scratch. Fill and save almost any type of static PDF form found online. By default, when you open a PDF form, all the interactive form fields will be highlighted for you to type and fill out. Insert text fields, buttons, checkboxes, radio buttons, list boxes or dropdown lists. Import data to a PDF form to reduce input errors and speed up workflow. Export data from PDF forms to FDF (.fdf) files for distribution and reporting.